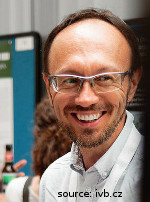 After Ph.D. in zoology, Martin took a series of postdoctoral positions and fellowships in the UK (Queen Mary London, Leicester, St Andrews) before establishing a lab in Brno. 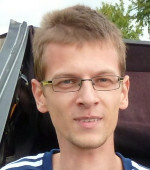 Matej’s PhD project was on comparative biology of native and invasive populations of gobies. 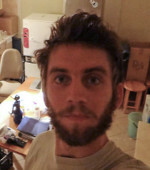 He joined the lab as a postdoc to study bitterling-mussel coevolution and continued with investigations on alternative life strategies in African annual fishes. After a stay at Jason Podrabsky’s lab in Portland State University, OR, USA, Matej took permanent position at the institute. 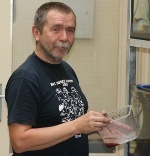 Radim is devoted field and experimental biologist. His current research is split between the cuckoo catfish brood parasitism and the applied side of our killifish research (defining driver mutations in killifish neoplasia). Milan succeeded in our ambitious plan to follow replicated wild killifish populations over their lifetime. 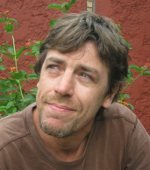 Over 30,000 km of car travel and 5 months camping in the Mozambican bush, a unique set of data and samples was secured! 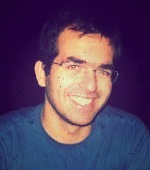 Milan studied the effect of invasive species on the bitterling-mussel relationship for his MSc., followed by a PhD. (2014) on experimental and field-based investigations into variability and reaction norms in the reproductive allocation of female killifish. He then completed a two-year internal postdoctoral fellowship, a short-term stay at CEREEP (with Tom Van Dooren, CNRS France; 2017) and six months postdoctoral fellowship in ANU, Canberra, Australia (with Mike Jennions). 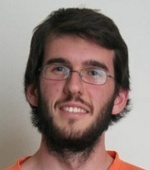 Pierick has joined our lab to combine theoretical work with empirical tests of predictions from his models. 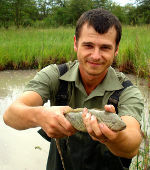 He works on cuckoo catfish brood parasitism and bitterling-mussel reciprocal parasitic relationship. Daniel is based at Universidad de la República in Montevideo, Uruguay, studying Neotropical annual killifishes in the heart of their distribution. His project uses Neotropical Austrolebias killifishes to understand the role of the evolution and coexistence of sympatric killifish morphotypes, including the roles of competition and population density on ageing and associated life history traits. A long way from the lab home has advantage to intensively study wild populations and perform field experiments. Jakub volunteered during the extensive 2016 fieldwork in Mozambique and now joined the lab as PhD. student enrolled at Charles University in Prague. Jakub pursues experimental approach to study various aspects of ageing in African killifish. 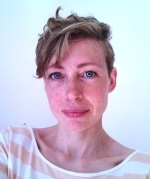 Caroline worked with us twice, separated by her position at National Institute of Aquatic Resources at Technical University of Copenhagen. She quantified the energetic costs in bitterling-mussel relationship and studied physiological parameters associated with extraordinary life history of annual killifishes. Pedro’s work aimed to understand competitive interactions between native and invasive freshwater mussel species, with a focus on population-specific details. He is now postdoc at UC Berkeley. Romain used experimental approach to look at the effects of non-native populations being transferred within species range, especially their impact on coevolutionarily-driven interactions. 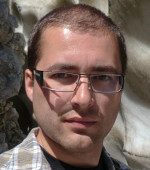 Radek worked on the link between personalities, alternative reproductive behaviour and mate choice, using a spectrum of our fish models (bitterling, Endler’s guppy, annual killifish). 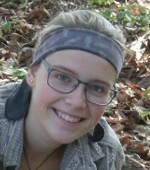 Markéta combined fieldwork, mesocosm experiments and behavioural observations to understand how sexual selection affects individuals and populations of the European bitterling fish.